The magnificent Hong Kong Tsing Ma Bridge view is spectacular. Moreover, the illuminated bridge around at night is splendid. If you are a landscape photographer or cityscape photographer, you would definitely love to take the bridge photos from the location. The photographic spot of the bridge is located in a tiny island called Ma Wan Island, which is less than one square kilometer. 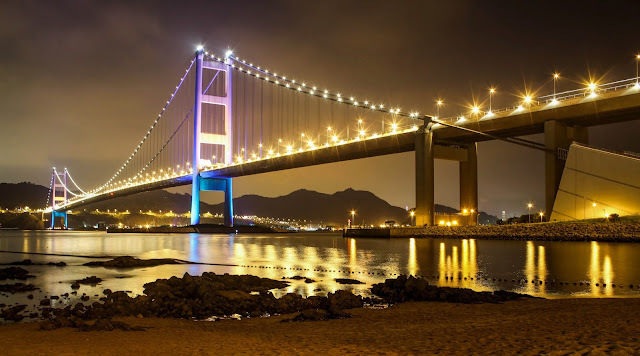 Even though there are many more places and vistas in the island, the Tsing Ma Bridge view from the Ma Wan beach, especially at night, is always splendid. You can walk from Park Island Pier to Ma Wan Tung Wan Beach. It only takes less than 10 minutes. Both day and night views are breathtaking; however, night view is more attractive.